This is worth a look even if it is to just drool. Unfortunately, that’s what happens when people wait too long to get rid of their stuff. You still get rid of it but not at or close to the going price. It happens to everyone that thinks they’re going to live forever. The buyers for this stuff are getting scarcer every day. Soon there will be very few....with a ton of parts for sale. I recall that happening in the early to mid 1990s. A lot of early motorcycle parts hoards started showing up at the big AMCA meets. I think a lot of old timers thought they could take that stuff with them. It's going to happen again within the next 10 to 15 years, but as Danny said, there may not be that many customers. That was a shop and was THE PLACE in the 60's and 70's for WLA parts in Australia. I think he bought three tons of Army parts and then sold them off part by part (not cheap either) and did really well for a long while. I done very well with Tony. He never forgot me either. Years later he would touch bases with me and say.... Are you still hunting one of these ? I'd say yeah. He would always be fair priced with me. 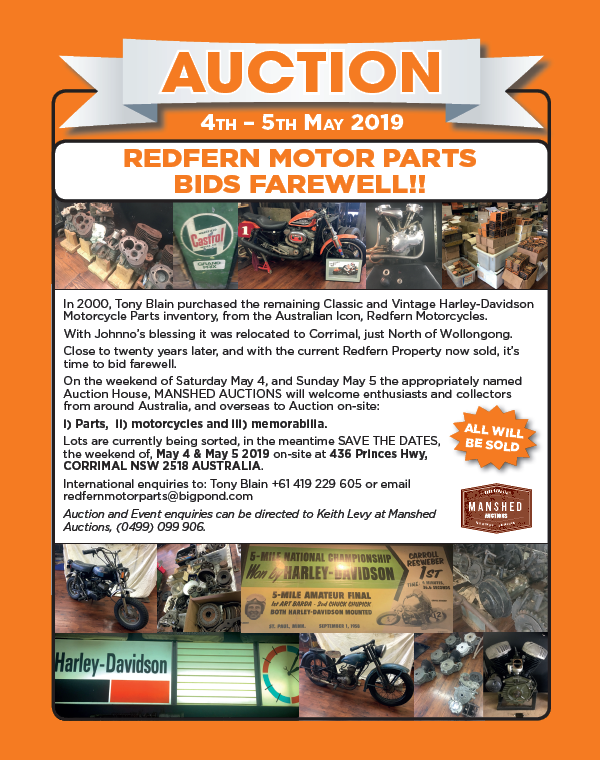 In the late-70s–early-80s I bought and sold nine Harley 45s and I used to ring Redfern’s for parts. In 1981 I rode my Panhead from Perth (west coast) to Melbourne (east coast) and on to Sydney (and return). In those days the shop was still in Redfern so I rode there, introduced myself, spoke to the owner for a while and had a look around. There were parts and bikes everywhere. In more recent years I bought Palmer’s second editions from the new shop as well as a few things for my Pan. now thats one hell of a ride ,back on the old roads too. Classic Harley vs vintage Indian motorcycle prices?